​Sleeping past the alarm on Sunday morning put us in a rush and between moving at a quicker pace and the morning routine getting out of order, I have to say honestly, we were a little on edge with each other by the time we left the house. Finally at church, I needed to go one way and he needed to go another, both of us walking away from each other briskly and agitated. By the time I made it to my seat in the worship center, the praise and worship team was already into their second number. As I sat down next to my daughter – her giving me ‘the look’ – I let out a heavy sigh and joined in on the singing, but my heart was struggling to worship. In David’s Psalm of Praise, when he mentions “His gates” and “His courts” he is referring to the Lord’s Temple. But today, we can also apply these words to when we are entering into our churches or worship centers. When I rushed into “His gates” – our church – that morning, where was my thankfulness? When I finally made it into “His courts” – our worship center – where was my praise? Oh, and where were my glasses? Great, now I couldn’t even read my Bible. Needless to say, my communion with God that Sunday was less than stellar. I allowed myself to be distracted by the circumstances of my morning and gave no reverence to the fact that I was entering into God’s holy house. I was focused on me, not Him. Focusing on Him… isn’t that what ‘going to church’ is all about? It’s about Him, God. Not me or my duties, not catching up with friends, not seeing who is/isn’t there and what they are wearing. It’s not even about what songs we’re singing or what passage of scripture is being preached. It’s all about Him, worshiping and praising Him. David is reminding us of that in this scripture. 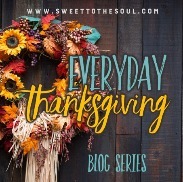 “enter His gates with thanksgiving”: for our hearts to be in a position of thanksgiving, we must choose to recognize the blessings provided by God in every situation. 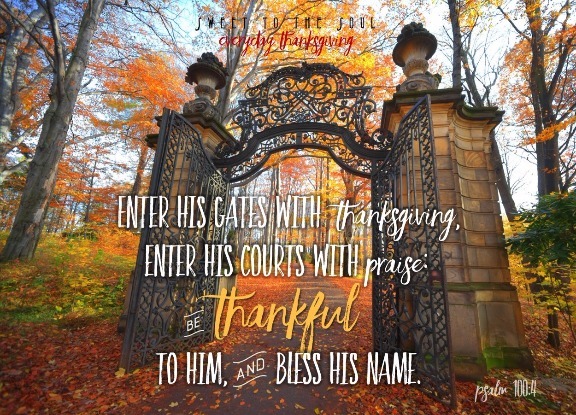 “enter His courts with praise”: to truly praise God we must acknowledge in our hearts His position of holiness and His role of savior, provider, redeemer, comforter. Thanksgiving and praise compel us to focus on God, not ourselves. "In all our public service the rendering of thanks must abound; it is like the incense of the temple, which filled the whole house with smoke. What better subject for our thoughts in God's own house than the Lord of the house. And into his courts with praise. Into whatever court of the Lord you may enter, let your admission be the subject of praise: thanks be to God, the innermost court is now open to believers." Please don’t misunderstand, my worship that morning wasn’t hindered because I was running late, it was hindered because I was not really worshipping God at all. My physical body finally got to the church, but my heart and spirit were distracted and not focusing on God at all. Friends, God is in His house and wanting eagerly to meet with us! To fellowship with us! When we enter His gates, it’s all about Him, not us. So whenever and wherever we go to meet with Him, let’s be thankful, let’s praise Him, let’s bless His holy name; let’s leave everything thing else outside and sit at His feet and give Him our full undivided attention, after all, He is giving us His.